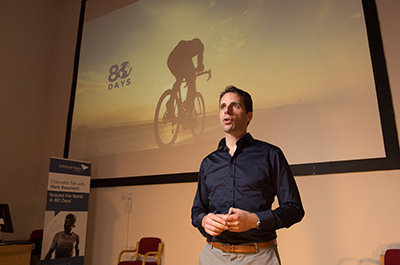 Round-the-world cyclist Mark Beaumont has shared the secrets of his record-breaking success. 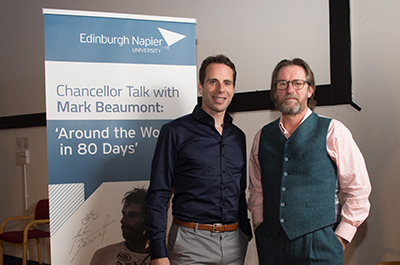 Mark spoke about how he completed his most recent Around the World challenge – an 18,000-mile route in less than 79 days - at the recent Chancellor Talk at Craiglockhart. Attendees were treated to the inspirational story of Mark’s life – from growing up on the family farm to the trials and tribulations that come with planning, training and completing an around the world cycling challenge. Guests also heard a number of tales from the Around the World challenge, including how his physio and mechanic had to learn dentistry over night after he crashed and broke teeth in Russia. Mark also gave an insight into how he meticulously planned and set the under 80 days target – and why it made more logical sense than many initially gave him and his team credit for. Last year’s attempt captured the imagination of a global audience by targeting Jules Verne’s Around the World in Eighty Days, as Mark and his team finished at the Arc de Triomphe in Paris a day ahead of schedule. The ride – during which the cyclist slept five hours a night and cycled for more than 16 hours a day – saw Mark set off from Paris and pedal through Europe, Russia, Mongolia and China, before reaching Australia and New Zealand. He returned through North America before “sprinting” through Portugal, Spain and France. 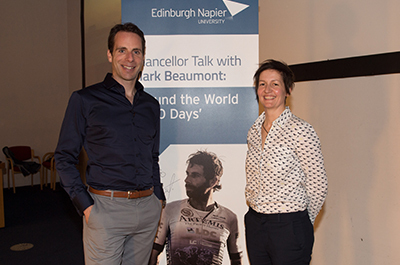 Also taking part in the event was Edinburgh Napier sport science academic Dr Lesley Ingram, who worked extensively with Mark to get him in the shape of his life for his epic adventure.